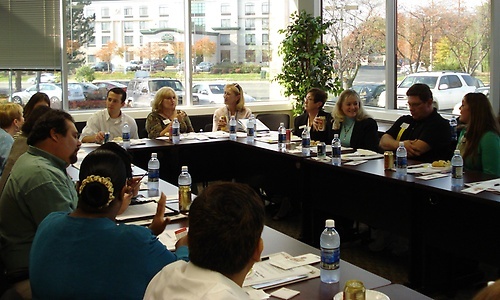 The Dulles Regional Chamber of Commerce (DRCC) exists to promote and advocate to further commerce in the Dulles Region. -Small Business-Offering opportunities for growth through networking events, business matchmaking and professional development. -Workforce-Concentrating on STEM education incentives, government contracting, innovation, veterans and diversity. -Economic Development-Focusing on transportation, commercial space, business advocacy and regulatory environment. -Community-Partnering encompasses the communities surrounding Dulles Airport, as well as area non-profits and quality of life issues. Diversity-First mainstream state chamber to have an Hispanic Business Council, Only local chamber in the region to have a formal position on Immigration Reform. From Rt 28 & Rt 50, go East on Rt 50 to 1st light, turn left onto Centerview Dr. Continue, staying Left of barrier. 3901 Centerview Dr will be on the Right. Turn Right into parking lot. Suite S.